Reese and Montero's record-setting trip to raise awareness for injured veterans and earthquake victims became top tweet in South America. Reese and Montero at Canoa Beach, where their record-setting 17-hour journey ended. "Turning back was not an option. I would have pushed the motorcycle the last 85 miles if I needed to." Professional endurance driver Carl Reese of Santa Clarita, California and Sebastián Montero of Quito, Ecuador set a new world record for riding on motorcycles from the closest point on Earth to the sun to an elevation at sea-level in a single day. After President of Ecuador Rafael Correa and Minister of the Interior of Ecuador José Serrano tweeted about Reese’s eighth world record attempt, the posts became the top tweets in South America. Reese and Montero reached a gain/loss in elevation of 56,678 feet during their endeavor. Ecuador is the only place on Earth where Reese and Montero’s world record can be accomplished, as the country is home to Chimborazo, the highest mountain in Ecuador. While Chimborazo (20,548 feet) is not the highest mountain by elevation above sea-level in the world, its location along the equatorial bulge makes its summit the closest point on Earth’s surface to the sun. 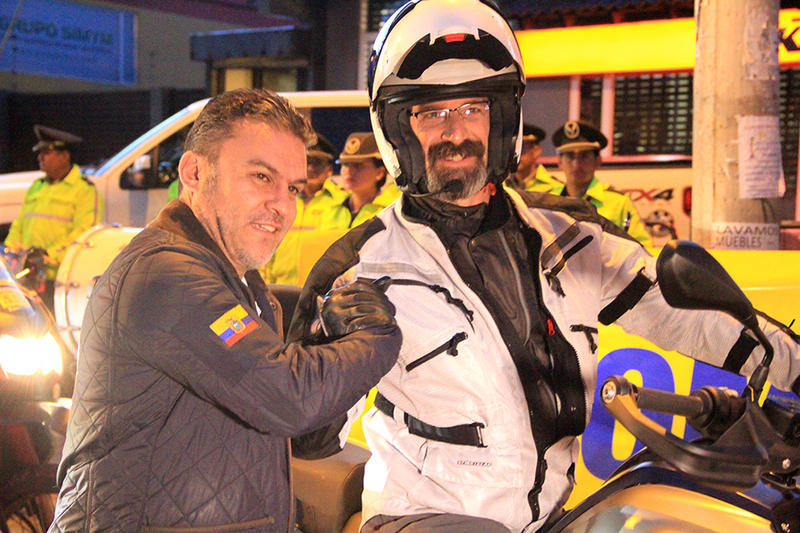 Although Chimborazo is typically off-limits to motorcycles due to the remoteness of the mountain in the case of an emergency, Minister Serrano granted Reese and his team special access to the natural wonder. Before daybreak, the record-setting team rallied at Gas Motors in Cumbayá (Quito) where Minister Serrano presided over the world record attempt’s opening ceremonies. With the street lined for two blocks with uniformed officers, a marching band played as Reese and Montero were led by a national police motorcade to the starting line atop Chimborazo. Twelve hours before the planned departure, misfortune set in. Reese became ill and severely dehydrated, prompting the suggestion that Montero ride alongside Reese to keep an eye on his condition while riding in the thin, mountain air. 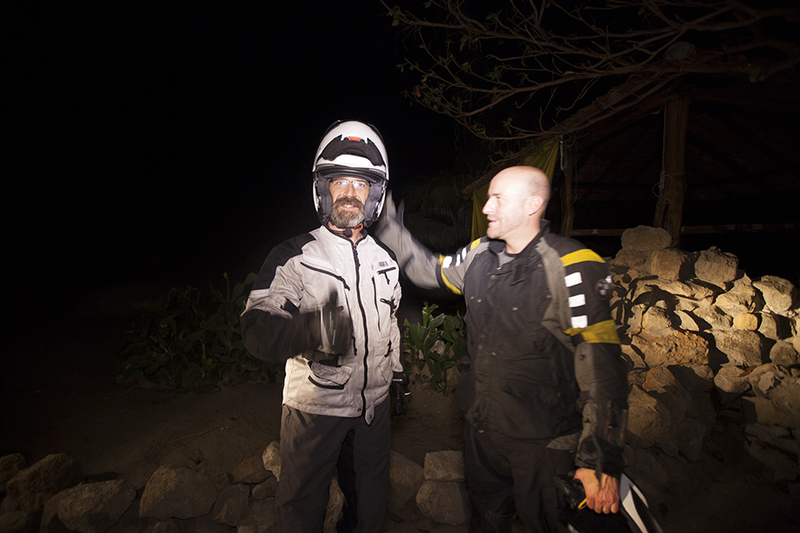 The two became fast friends as they maneuvered their motorcycles along jagged cloud-forest peaks and hairpin bends, traveling from the snow capped Andes through a lush, green, tropical landscape to the finish line near the Pacific Ocean. Reese and Montero embarked on this record-setting ride to bring awareness to the Coalition of Hope Foundation’s efforts to rebuild Ecuador after the devastating 7.8 magnitude earthquake this past April. On a tour, led by Minister Serrano’s staff, Reese witnessed and learned about the heart breaking aftermath of the earthquake, including the loss of over 650 lives and 26,000 homes. In addition to bringing attention to the Ecuadorian earthquake victims in need, this record attempt was an effort to increase awareness of the Motorcycle Relief Project, a 501.3 (c) charity that provides relief to combat veterans with post-traumatic stress disorder and other injuries. Reese and his fiancé, Deena Mastracci, have set multiple transcontinental records to bring awareness to the Motorcycle Re-lief Project. Reese used FirstGear-USA®'s Adventure Mesh Jacket, Kilimanjaro Pants and Vented Low Boots to keep himself comfortable and protected from the extreme weather changes during the descent from the top of the snowy Andes Mountains, through the humid jungle, to the cool evening weather along Ecuador’s coast. The trip was captured on film by Brad Barker, of Epic Nomad Productions, and will be featured on Barker’s YouTube channel, “The Ride of My Life.” Barker is an Emmy Award-winning producer based in southern California who has worked on Discovery Channel®, History Channel® and several documentaries. Barker was instrumental in putting this project together. 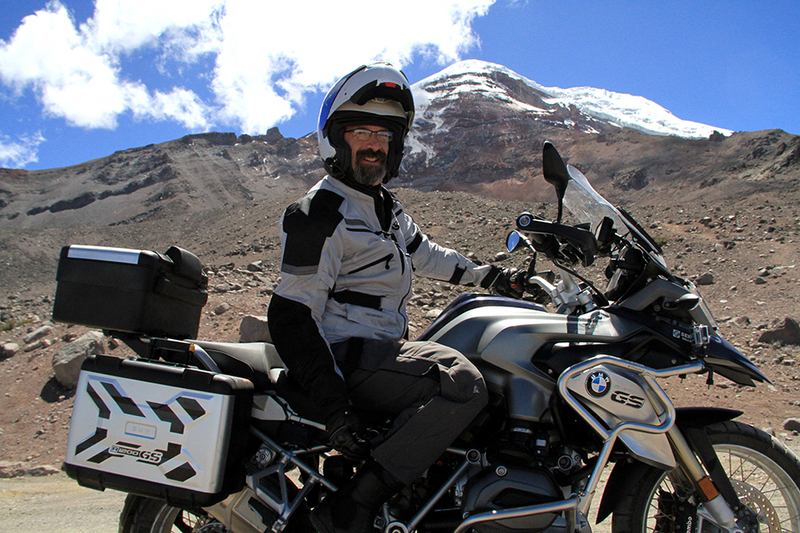 The 2016 BMW 1200 GS that Reese rode was on loan from a member of Brosters Group – BMW Motor-rad Club Ecuador, Dr. Sergio Vallejo Rojas. A live map of the ride was provided on CarlReese.net by GPS Insight, as was the telemetry equipment used on the journey. GPS Insight is the leading technology provider of GPS tracking software for businesses with vehicles and other mobile assets. The team will submit their telemetry equipment to Guinness World Records for further verification. The route taken by Reese and his team was formulated in collaboration with Minister Serrano, Barker and Freedom Bike Rental of Ecuador. Brosters Group - BMW Motorrad Club Ecuador, provided pre-trip logistics coordination and on-road support for the team throughout the day. Trip photos and video footage from the record-breaking journey are available to members of the media upon request. For more information about this trip and future expeditions, follow Reese’s Twitter account, @EnduranceDriver. Please direct all media inquiries to Shannon Cooper at 410-420-2001 or by email at shannon.cooper(at)fallstongroup.com. Carl Reese is an endurance driver. Reese has set more transcontinental records than anyone since Edwin “Cannonball” Baker. Reese and his team have set eight world records, most notably the Solo Motorcycle “Cannonball” Record from Los Angeles to New York in 38 hours and 49 minutes. Reese was born in Mercer, Pennsylvania and now resides in Pine Mountain Club, California. Reese is currently working on a full feature documentary, “Iron Riders: History of Motorcycle Records.” Reese is active on Facebook at https://www.facebook.com/EnduranceDriver. Sebastián Montero is a motorcycle enthusiast who rides adventure motorcycles as a hobby. Montero is a business man who works for CONFITECA®, the leading confectionery company in the Andean region, and owns CASSAVE®, a healthy snack retail business. He was born in Santiago, Chile and now re-sides in Quito, Ecuador. 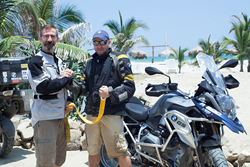 Montero is one of the founding partners of Brosters Group - BMW Motorrad Club Ecuador. A group of adventurers led by Brad Barker and his Emmy Award-winning film crew travel the world via their motorcycles, exploring nations and experiencing new cultures. Brad Barker’s work has been featured on History Channel® and Discovery Channel®. Barker’s production company also has a YouTube channel, where they document their travels. Visit http://www.therideofmylife.net for more information. A team of 60 souls that are moved for the passion of adrenaline, friendship and riding motorcycles, Brosters Group – BMW Motorrad Club Ecuador was voted the number one BMW Motorrad Club in Lat-in America for their philanthropy work in the earthquake torn region and for their work with other charities serving people in need all over Ecuador. For more information, visit https://www.facebook.com/BMWBrosters. 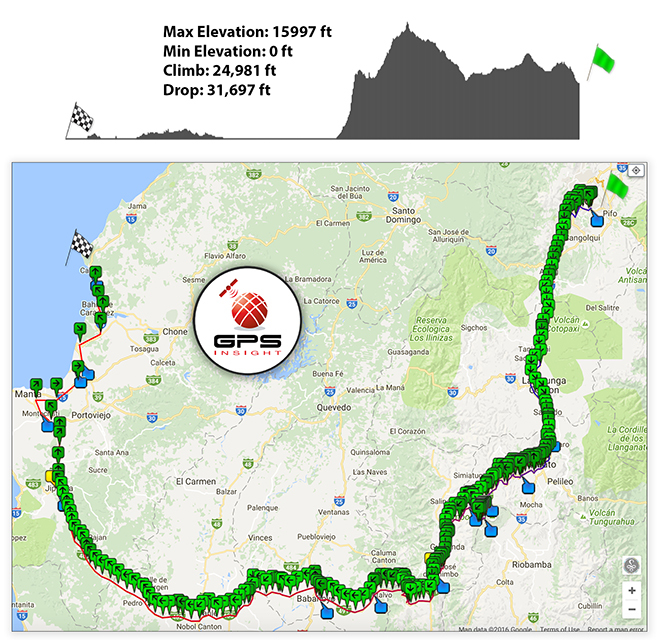 A map of Reese and Montero's record-breaking route from Chimborazo to Canoa Beach provided by GPS Insight. The record-setting duo at Canoa Beach just seconds after crossing the finish line at 10:22 p.m. Reese and Minister of the Interior José Serrano pose for a photo at the starting line before Reese and Montero began their expedition. Reese atop Chimborazo, the highest mountain on Ecuador, boasting the closest point on Earth to the sun.